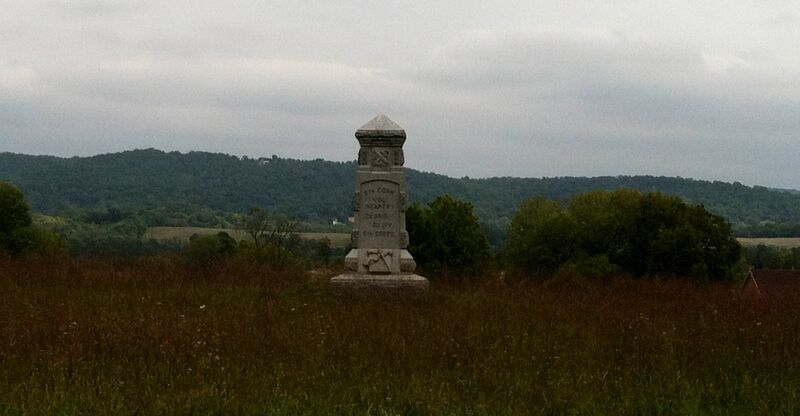 On the afternoon of September 17, 1862 as the 8th Connecticut climbed the rolling hills toward Sharpsburg, Company K temporary captured the Confederate artillery battery of Captain David Gregg McIntosh. 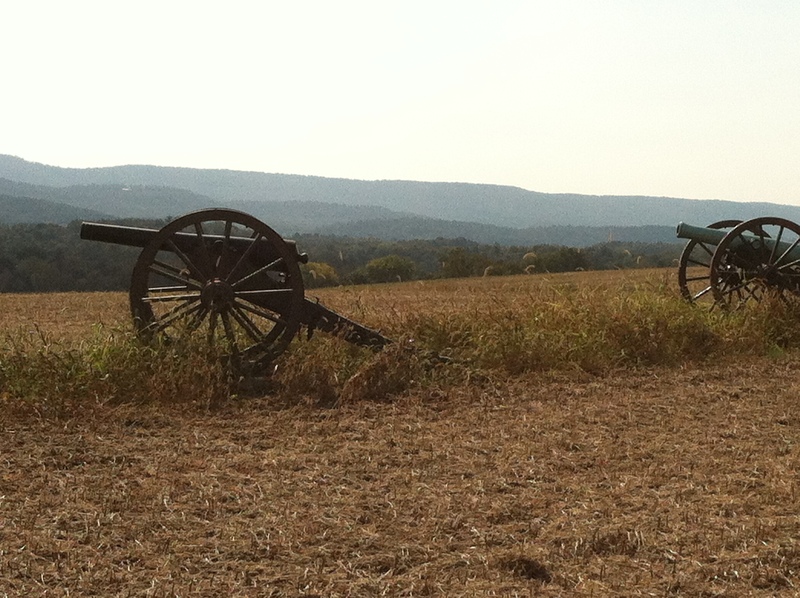 Today, two guns represent that battery in the approximate location on the battlefield. From the Diary of Roger M. Ford 1st. Lt. Co. K, Eighth Conn. Vols., Antietam National Battlefield collection. Daylight reveals the gray skies of the previous day are gone and McClellan has missed his opportunity to renew the attack against Lee’s battered army. During the night, General Lee has moved his entire force away from Sharpsburg in a retreat across the Potomac and back into Virginia. The Army of Northern Virginia has slipped away leaving the field to the Union forces. This is cause enough for “Little Mac” to claim a great victory for his army and salvation for the Union. President Lincoln is not fooled by the flowery rhetoric of the young general who will eventually be relieved of his command for failing to pursue Lee’s greatly reduced army as they escaped back into Virginia. With the Confederate forces gone from the field and moving across the Potomac, Union units now begin to enter the contested ground from Wednesday’s battle in order to evacuate the wounded and bury the dead. While details are assigned the duty for each unit, many individual soldiers begin looking for their friends and relatives. On the Union left, it is a gruesome scene with hundreds of dead and dying of both sides strewn across the rolling hills between the Antietam Creek and the Harpers Ferry Road. This description taken with Marsh’s report of the unit positions on the day of the battle make it clear that the remains were removed from the “high water mark” area near the present-day monument. The area of the hay stacks is located to the north John Otto’s 40-acre cornfield in the area where the 8th regrouped for the final assault on the day of the battle. Ariel and Alonzo Case of the 16th CVI are given permission by their commander to search for the body of their brother Oliver Case of Company A, 8th CVI. The brothers believe that Oliver was killed in action based on the conversation with Oliver’s friend onthe night after the battle. Despite their ominous feelings about the fate of their younger brother, Alonzo and Ariel fill their canteens prior to starting the search. Private Oliver Case would now lie silently behind Otto’s farmhouse awaiting his final journey…home. Having witnessed the advanced position of the 8th and the intensity of the fighting, Alonzo and Ariel Case are greatly concerned about the welfare of their younger brother. They find the remnants of the 8th to seek out information on Oliver from the other soldiers of the regiment. The Case brothers find a friend of Oliver in the significantly reduced ranks of the 8th who relates the story of the battle to them. This unknown friend tells Alonzo and Ariel that he witnessed Oliver fall to the ground during the final assault and called out his name, but Oliver did not respond. Major Ward leads the regiment away from the high water point to the safety of the Otto farm without Private Oliver Cromwell Case. The brothers’ hopes are dashed for finding their younger brother alive. Now they can only wait for the opportunity to search for him. These 17 days in September have ended for Oliver. After Snavely’s Ford is determined to be an adequate crossing site, the remainder of Harland’s Brigade is moved down the creek. Due to dwindling supplies of ammunition, the Georgia troops on the far side of the Antietam pull back from the high bluffs overlooking the bridge as the other IX Corps units successfully secured the Rohrbach Bridge almost simultaneously. The 8th CVI is temporarily detached to provide protection for a Union battery on the far side of the creek. Although still under some fire from the high bluffs on the far side of the creek, Rodman’s division crosses the Antietam at Snavely’s ford and realigns the regiments as it prepares to move up a ravine toward Sharpsburg. 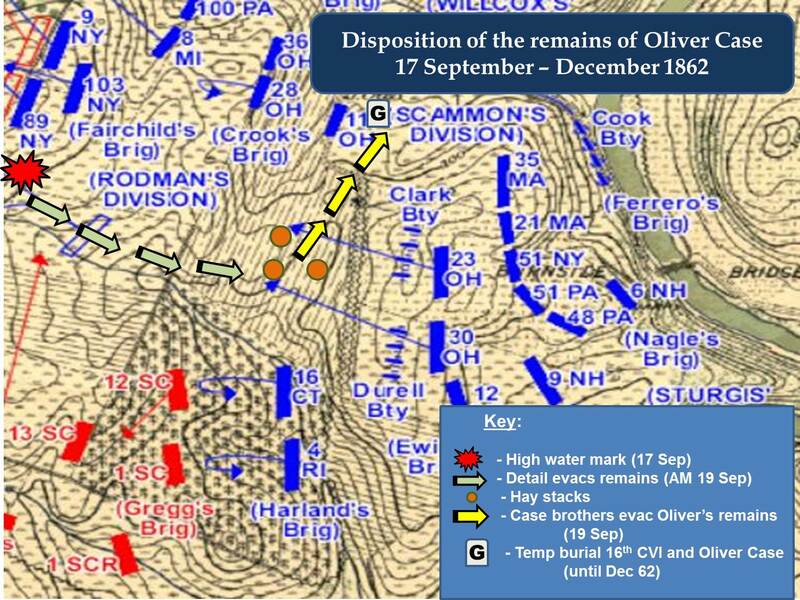 As the crossing operation draws to a close, Oliver Case and the other soldiers of the 8th Connecticut rejoin Harland’s Brigade for the movement over the rolling hills toward Sharpsburg. Harland’s Brigade is ordered to the far left of Rodman’s Division with the 8th on the right of the brigade. After the IX Corps units that crossed Rohrbach Bridge are resupplied, all the units begin to climb the ridge leading to the Harper’s Ferry Road and Sharpsburg. The terrain is actual a series of rolling hills and swales terminating near the Harper’s Ferry Road which leads into the town of Sharpsburg. The terrain makes it difficult for the Union commanders to determine the strength and disposition of the Confederate forces to their front. Around this time, the 8th CVI executes a countermarch. The reason for this countermarch may have been to properly position the regiment in the brigade line of march as they began to climb the ridge. General Rodman orders his division to advance toward Sharpsburg and the Confederate defenders. On the right, Fairchild’s Brigade begins to advance. Harland orders his brigade to advance, but only the 8th moves forward. The 16th CVI and the 4th Rhode Island do not advance. This soon puts the 8th far in front of the brigade and leaves them unsupported by any other units. Harland notices that the 16th and 4th are not moving as instructed. He requests guidance from Rodman as to halting the 8th so that the other regiments might come on line. 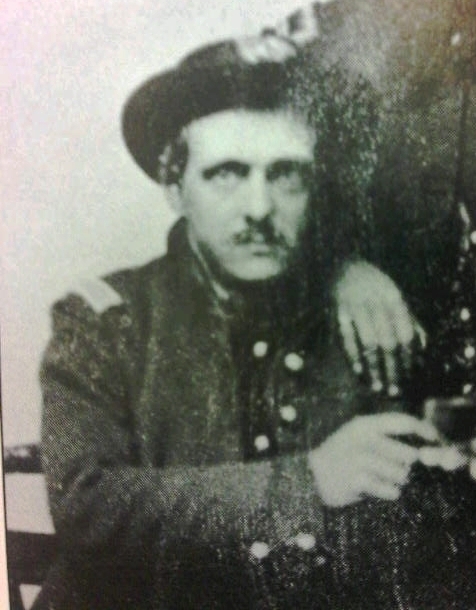 Rodman, likely realizing that the Confederates are being reinforced, instructs him to let the 8th advance. Rodman assumes the mission of hurrying the other two regiments. As the Colonel Harland continues to move forward with the 8th, he notices what Rodman may have observed only moments before, that the Confederates are being heavily reinforced and are now appearing on the left flank of his brigade. General Rodman is attempting to turn the 16th CVI to face left and exposed the flank to the Confederates. It is believed that about this time, Lt. Wait is severely wounded as he is closing the ranks and encouraging the soldiers to move forward. About this time, Rodman likely realizes his mistake in not stopping the 8th because Harland’s Brigade is now extended forward with a heavily exposed right flank. Rodman is unable to affect any changes to the disposition of troops because he is shot in the chest as he is attempting to turn the 16th toward the Confederates on their flank. Men from the 8th bear his body to the rear. He will linger for several days before succumbing to his wounds. At almost the same time as Rodman’s mortal injury, Colonel Harland turns his horse to alert the 16th of the danger, but his horse is shot from under him. Uninjured, Harland continues toward the green regiment on foot. Although Harland continues toward the 16th on foot, he is unable to turn the “green” units owing to the uncertainty of battle and their location being in the middle of a cornfield. The new troops, with only three weeks of service, are confused by the order and panic soon strikes in the ranks. The soldiers of the 16th, followed by the 4th R.I., break and run from the field. The 8th CVI continues moving forward and to the right toward the crest of the hill near the Harper’s Ferry Road held by Confederate infantry under Toombs. Toombs has moved McIntosh’s Battery to meet the advancing Union regiments. CPT McIntosh orders his men to fire canister directly into the advancing Connecticut troops now only 50 to 75 yards to his front. Captain Upham and soldiers of Company K, 8th CVI are detached from the main body and sent to suppress the withering fire from McIntosh’s Battery of three guns. [McIntosh’s Battery was] ordered by A.P. Hill to report to Kemper on the left of a cornfield and support the right of Jones’ Division. The guns were limbered up and went at a gallop directly across the fields and came into the Harper’s Ferry road at the northwest corner of what is known in the Confederate reports as the “narrow cornfield” and then moved up the road a few yards, in the direction of Sharpsburg, to a gate in the plank fence, where it waited in the road for Brown’s Battery, leaving the field, to come out. CPT Upham and his troops lose the guns, but rejoin the main body of the regiment to continue the fight. The regimental commander has changed the direction of his movement to meet the fire from the front and the left flank. Fairchild’s Brigade fighting to the right of the 8th is ordered to retire from the field. The 8th continues to fight, but is being flanked by the 7th and 37th North Carolina regiments of Hill’s Division pouring in a withering fire from the left. The regimental commander, Lieutenant Colonel Appelman instructs his color guard to “never leave the colors.” In quick succession, all the members of the 8th CVI’s Color Guard are killed in the fighting. Shortly thereafter, Colonel Appelman is seriously wounded and carried from the field. Major Ward assumes command of the 8th as it continues to receive concentrated fire from the left flank. General Toombs has reformed the remnants of his brigade plus other stragglers moving through the area to retake McIntosh’s Battery and shape a new defensive line in front of the 8th. The fire builds from the front as these troops reform. It is at this point in the battle Private Oliver Cromwell Case of Company A, 8th CVI is killed by a bullet that strikes him in the head just above his ear line. Based on his brother’s description of the wound, the bullet came from the North Carolina troops on the regiment’s left flank. Case falls near his friends and fellow soldiers of the 8th Connecticut Volunteer Infantry Regiment where he has served for one year plus one day. Realizing that his isolated regiment is about to be flanked by the fresh Confederate troops of Hill’s division, Major Ward orders the 8th to retreat to a safer position. The men are stubbornly defending the territory they’ve paid for in blood and it takes the new commander three attempts to get the soldiers to abandon the fight. It is only when Major Ward appeals to them to rally around their colors that the soldiers relent. Although some Confederate accounts seem to disagree, the majority of the witnesses from both sides testify that the regiment retired in good order following their colors. The 8th finds shelter and rest in the swale near the Otto House. Rest is relative and may be short lived because the Union commanders fully anticipate a Confederate counterattack at any moment. However, Confederate soldiers all along the lines are used up and there are no significant reserves, so the counterattack will never come. Although General McClellan is holding an entire corps of fresh troops in reserve located near his headquarters at the Pry house, the units on the Union left are totally exhausted from the day’s fighting and a relative calm falls across the battlefield as the daylight fades away. [i] “With Burnside at Antietam,” David L. Thompson, Battles and Leaders of the Civil War: Volume I, edited by Robert Underwood Johnson and Clarence Clough Buel, The Century Co., New York, 1887-1888. The troops of the 8th Connecticut are awakened by the officers and non-commissioned officers of the regiment as they are told to prepare immediately for battle. An intermittent rain has fallen throughout the night and a light fog is rising from the Antietam Creek as the soldiers begin to stir from their ready positions of the night to seek coffee and check their equipment. Most of the troops understand that this will likely be the day of the big battle and anxiety runs high throughout the regiments of the IX Corps. As daylight breaks the gray sky, a group of inexperienced troops meander over the ridge facing the Rohrbach Bridge to catch a glimpse of the Confederates defending the stone span over the creek. This gives the Confederate artillerymen on the ridge above the bridge the opportunity to determine the location and gauge the range of the Union units scattered around the Henry Rohrbach farm. The Confederates begin to shell the units of the IX Corps including Rodman’s division and Harland’s brigade. In response to the incoming artillery fire, Colonel Harland moves his brigade down the Rohrbach lane to evade the fire and support a Union battery. The Confederates continue lobbing shells that are air burst artillery rounds as well as solid shot. Captain Marsh notes that there was no counterbattery fire from the IX Corps artillery units. Colonel Harland moves his brigade to the left rear into a swale and then faces the brigade to the left. This provides more protection for his troops as they await orders for the battle everyone now knows will take place today. A Confederate solid shot from artillery across the creek lands in the 8th CVI’s area killing three soldiers and wounding four in Company D. There may have also been a separate artillery attack before the brigade was moved. Nonetheless, several soldiers of the 8th were killed or wounded during these bombardments including a members of Companies F and A and a Sergeant George H. Marsh of Company A. According to Jacob Eaton, an officer in the 8th CVI, after the incoming artillery, the soldiers panicked and scattered to avoid more incoming fire. Lt. Marvin Wait, Company A, 8th CVI is covered with dirt from the impacting rounds and blood from the wounded soldiers, yet he helps to calm the men and reform the unit. The incoming artillery fire concerns Colonel Harland so that he repositions the 8th by moving the regiment back to the front of his brigade. In a further attempt to protect the regiments from the incoming fire and prepare for future orders, Harland begins to extend his lines to the left by moving his brigade. The brigade is now short the 11th CVI who have been detached by General Rodman to serve as skrimmers for the Rohrbach bridge assault. The artillery continues to pour in on Harland’s Brigade and the 8th CVI is relocated to a ravine further to the left of the line. This provides some protection from the shelling. There is a great deal of controversy regarding the timing of General McClellan’s order to General Burnside to begin the attack and assault the bridge. However, around 10 o’clock the orders are issued by Burnside and the assault begins. The 11th CVI is designated to act as skirmishers in the attempted capture of the Rohrbach Bridge. They move quickly to the left of the stone bridge, but are in an exposed position. The mission quickly becomes a disaster for the Connecticut regiment as the Georgia troops on the far side of the creek have clear fields of fire on the skirmishers. Captain Griswold of the 11th valiantly leads his company of the 11th in an attempt to wade the creek just below the bridge. Many of his men are shot down in the water but Griswold makes it to the far side of the creek despite being struck by several minnie balls. The young captain falls dead on the far bank. He is first Union soldier to cross the Antietam that day at the lower brigade, but it is in vain. The ill-fated attempt to capture the bridge now stalls as the regimental commander, Colonel Kingsbury, is mortally wounded leading his troops. About the same time or shortly thereafter, two companies of the 8th CVI are sent downstream to find a ford. The remaining soldiers and officers of the 8th CVI watch the attempts to take the bridge by New York and Pennsylvania regiments. Captain Marsh calls it “the Grandest sight of my life.” It seems that Marsh is watching the attempted assault by Crook’s brigade. Crook was unable to get his brigade beyond the fence along the Rohrbach Bridge road. Rodman’s division was ordered to move left, downstream to cross at the ford supposedly identified the previous day by General McClellan’s engineers. Two companies of the 8th CVI are sent to find the ford. The ford identified by the engineers is not Snavely’s ford, but a closer yet inadequate crossing site. It is being defended by sharpshooters of the 50th Georgia on the high banks of the far side of the creek and Rodman quickly determines the division cannot cross at this site. The companies of the 8th continue down the creek in search of the ford. It takes Rodman’s division two hours to locate and move to Snavely’s ford although it is only two miles from the Rohrbach Bridge. [ii] The Military and Civil History of Connecticut: The War of 1861-1865, W.A. Croffut and John M. Morris, Ledyard Bill, New York, 1868. [iii] Memorial of Marvin Wait, Jacob Eaton, Thomas J. Stafford, New Haven, 1863. 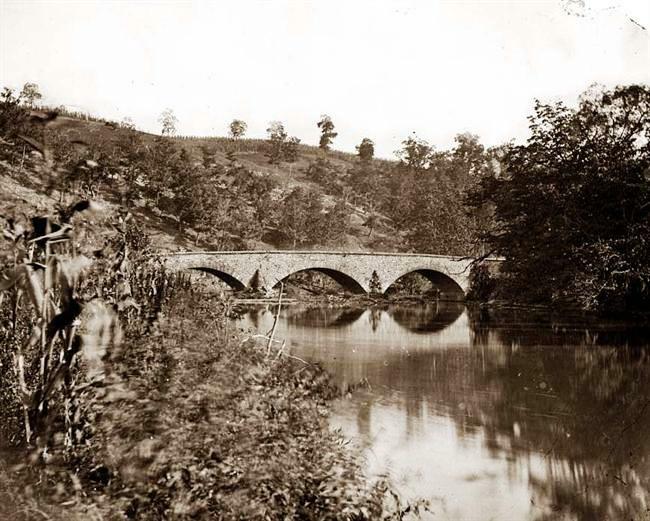 The order is given to leave the position near Keedysville and the 8th continues the march toward the far side of the Antietam Creek opposite the town of Sharpsburg near the Rohrbach Bridge (aka Lower Bridge and later known as Burnside’s Bridge). The regiment is placed into a line of battle behind a hill opposite the Rohrbach Bridge about 1:00pm. The wagon trains are shelled and 4 soldiers are killed. 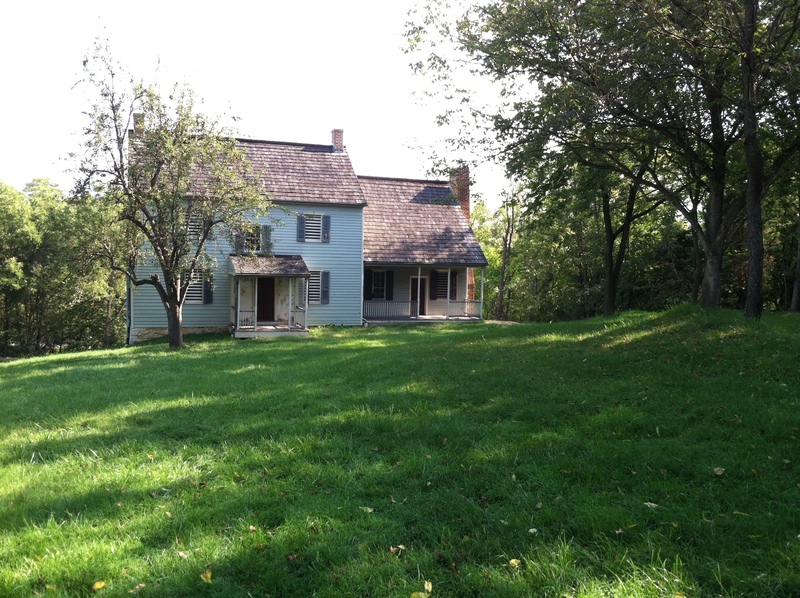 Near nightfall, the regiment settles into battle positions for the night on ridge behind the Henry Rohrbach farm house and about 300 yards from the Antietam Creek. Captain Marsh described the night as “dark and misty.” The Union regiments were not allowed to light fires. However, the glow from the fires of the Confederate soldiers across the Antietam could be clearly seen. All the officers and men seem to understand that tomorrow there will be a large battle. Whatever the case, by dark on the 16th of September, the regiment is now located with Harland’s Brigade. If Marsh is correct then September 15 could be the day that Oliver Case was reunited with his two brothers, Ariel and Alonzo, who are members of the 16th. Alonzo Grove Case was born in the old Case homestead on Terry’s Plain in June 1834. He attended the one room schoolhouse close to his home, and continued his education at the Connecticut Literary Institute, Suffield and Wilbraham Academies. At the age of 25, he married Julia Chafee of Simsbury and ultimately fathered nine children. 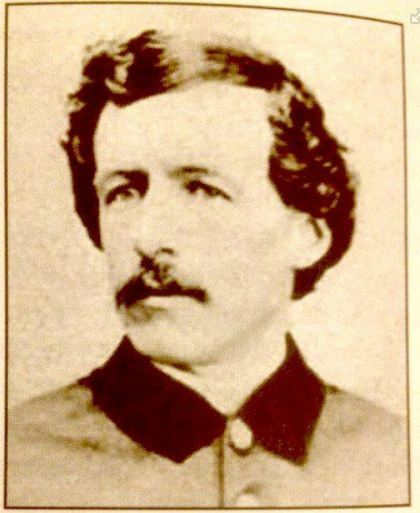 He continued to farm until 1862 when he enlisted to fight in the Civil War, and was assigned to Company E, 16th Connecticut Volunteers. Mustered in as a private, he was promoted to the rank of First Sergeant within a year, then to Second Lieutenant, and by the time he participated in the Battle of Plymouth (Virginia) in April 1864, he was a First Lieutenant. Although wounded in the side at Antietam (the same battle that claimed the life of his younger brother, Oliver), he recovered and took part in many other battles until the fateful one at Plymouth. Shot in the foot, he was taken prisoner and confined to the infamous Andersonville Prison for several months before being transferred to prisons in Savannah and Charleston. Alonzo died on May 5, 1902 and is buried in the Hopmeadow Cemetery in Simsbury. Ariel Job Case was the oldest son of Job Case and Abigail Phelps and was born on June 3, 1831 at Simsbury. He married Mary E. Thompson with whom he fathered five children including his youngest son born on September 11, 1862 who was given the name Oliver Cromwell Case. 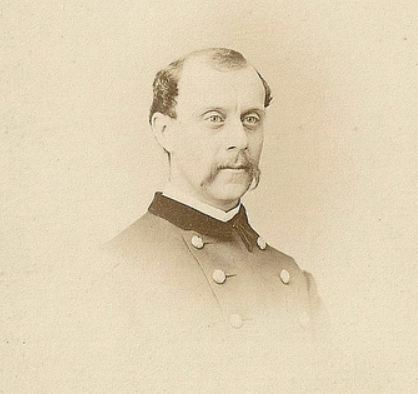 He enlisted in Company H of the 16th CVI on August 5, 1862 as a private then went on to achieve a promotion to sergeant and then second lieutenant before being mustered out of service on June 24, 1865. Ariel Case died on 18 September 1875 at age 44 and is buried in the Hopmeadow Cemetery in Simsbury along with his parents and brothers. Conditions for the soldiers of Harland’s Brigade are austere, but they make the best of the situation. An officer from another brigade in Rodman’s Division described the weather that greeted the Union soldiers that evening as they lay on their arms and speculated about what tomorrow would bring. [i] The Ninth Regiment New York (Hawkins Zouaves), Matthew J. Graham, E.P. Coby & Company, New York, 1900. [iv] History of the Sixteenth Connecticut Volunteers, B.F. Blakeslee, The Case, Lockwood & Brainard Company, 1875. [v] “The Sword of Alonzo Case,” Lois W. Calvert, SimsburyGenealogical and Historical Research Library Newsletter, 1997. [vi] The Military and Civil History of Connecticut: The War of 1861-1865, 1868 by W.A. Croffut and John M. Morris, 1868. After a long and anxious night of lying in their battle positions, the officers and soldiers of the 8th Connecticut wake early with orders to assemble for movement. The regiment moves to the far side of the Old Sharpsburg Road and then is ordered to return to the eastern side of the road. Along with the rest of Harland’s Brigade, the 8th then conducts a movement toward Fox’s Gap at the top of South Mountain. Prior to reaching the summit, all of Rodman’s Division is commanded to form a line of battle and prepare for possible resistance from the Confederate forces. However, there will be no more fighting here because all the Confederates are gone except those who now lie where they fell the day before among the rocks and trees. The main body of the Army of the Potomac crosses South Mountain and General McClellan establishes his headquarters in the German Reformed Church in Keedysville as he considers his next move against Robert E. Lee. The 8th CVI marches on into the night from Fox’s Gap and arrives in Keedysville around midnight. It does not appear that the soldiers were allowed to establish any type of camp but “lay on their arms” through the remainder of the night in a stubble field. For the foot soldiers of the 8th CVI, there are other important events of this day. Buell writes in his diary that the regiment “recd a mail for our Regt..only one letter for Comp E that for Capt.”[vi] As a soldier who normally received a large volume of mail (as indicated by some of his letters to his sister, Abbie), it is to be expected that Oliver Case received some amount of letters and possibly newspapers this day. [i] The Military and Civil History of Connecticut: The War of 1861-1865, 1868 by W.A. Croffut and John M. Morris, 1868. [ii] Forty-Six Months with the Fourth R. I. Volunteers, George H. Allen, Reid, Providence, 1887.